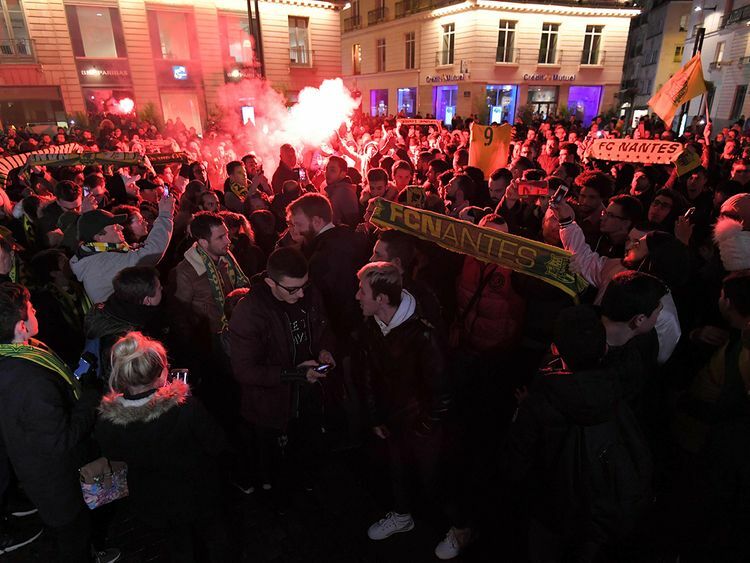 Nantes: Hundreds of Nantes supporters came together in the city centre to pay tribute to Emiliano Sala on Tuesday, after a light aircraft he was travelling in disappeared over the English Channel. The Argentine striker, signed for Premier League strugglers Cardiff City on Saturday from the French club for a reported fee of 17 million euros (Dh71 million), was flying to the Welsh capital aboard the plane that disappeared from radars around 20 kilometres north of the island of Guernsey on Monday night. Fans placed flowers, scarves and flags on the water fountain and chanted the striker’s name at Place Royale in the northern city. Members of the Nantes faithful praised Sala who had scored 12 goals in 19 league matches this season. “He was in full-form, it’s tragic. He had his whole career ahead of him, not behind him,” 27-year-old local worker Jessie Balsac said. “He was a humble man, who didn’t make a fuss, I didn’t expect to see so many people but it doesn’t surprise me, it shows how much he was liked by the supporters,” added baker Ludovic Bon who was accompanying his daughter at the vigil. “There are children who have lost someone. He was a model for kids,” Isabelle Lanrivain, 37, said. The search for Sala was postponed until sunrise on Wednesday, with police on the British island warning that survival chances were “slim” if the aircraft landed on water.